At its most basic, honey bees produce honey, which humans use in all sorts of culinary and brewing and domestic ways. But where those bees live, what pollen or nectar they feed on, and when their honey is added to the brewing process all determines how the final beer tastes. This is probably the first of many times I’ll type this phrase: No, honey beers are not always sweet. KettleHouse’s honey hefeweizen isn’t too sweet or overtly honey-flavored because of when its brewers add honey in the brewing process. 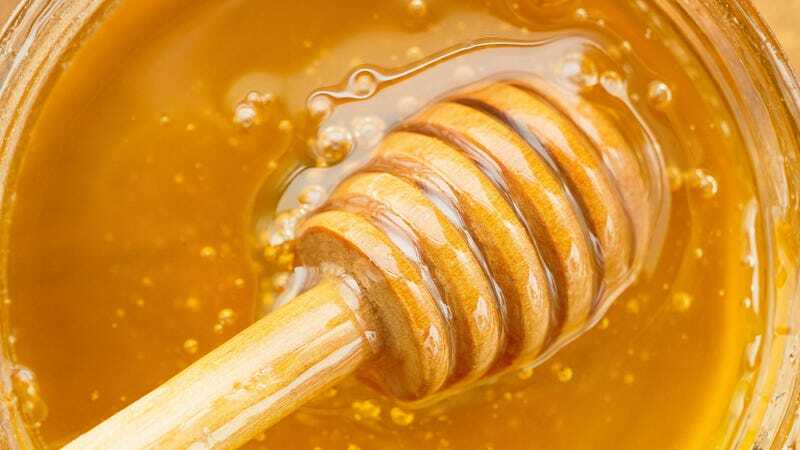 When honey is added before the wort (unfermented beer) goes through fermentation, yeast are able to gobble up most of its sugars and turn them into alcohol. Honey breaks down into glucose and fructose, two simple sugars that are easy for yeast to consume. Conover estimates that almost 95% of the honey’s sugars are converted to alcohol during the fermentation process. But if a brewer adds honey too early in the wort-boiling process, they’ll burn off all the beautiful honey aromas and flavors. That’s why many brewers add honey just at the end of the boil, trying to lock in those aromas while still allowing the yeast to eat up most of the sugars. Brewers could also add honey after fermentation, but they’re well aware honey is a natural, agricultural product full of enzymes and microbes that could potentially wreak havoc if a brewer isn’t careful. Another misconception about honey beers is that they’re all heavy or sticky in body. Not so. If a brewer added honey directly into the fermented beer, sure, the liquid would probably become a bit more viscous. But when yeast convert honey’s sugars to alcohol, that alcohol in fact thins out a beer’s body. Unfermented sugars make a beer feel thicker; when they ferment out, there’s less of what’s sometimes referred to as “chewiness” left in the beer. If you want to delve even deeper into what honey can do for a beer, start with the question: What type of honey are we talking? The pollen or nectar bees feast on, whether it’s clovers or orange blossoms or dandelions, changes the way honey tastes. When I lived in Phoenix, I tasted half a dozen different honeys at the Arizona State Fair; the difference between honey from bees who’d visited cactus flowers and honey from bees who’d visited citrus flowers was surprising. (If you ever get the chance, do a honey tasting, is what I’m saying.) That translates to the final beer, too: An earthy-smelling honey will express that in a beer, and the same goes for a citrusy honey or a floral honey or a toasty honey. Quality, local honey doesn’t come cheap, especially in the quantities medium-sized breweries need. KettleHouse’s Conover says the brewery has purchased 3,000 pounds of honey already this year from Arlee Apiaries in Arlee, Montana. Tripp Collins, chief operations officer for Gadsden, Alabama’s Back Forty Beer Co., says brewers use 120 pounds of honey to make each 30-barrel batch of the brewery’s flagship Truck Stop Honey Brown Ale. At the same time Back Forty began brewing more batches of Truck Stop a few years ago, the price of honey also increased dramatically, making the honey source a sticking point. Bee health has a source of concern for beekeepers and the agricultural industry over the past decade or so. And of course, bee health affects the honey supply. Years ago, Colony Collapse Disorder presented a mystifying problem for beekeepers, but now many think it’s agricultural pesticides and disease that pose the greatest danger. Not only does the honey industry depend on honey bees, but so does our entire food chain. According to the American Beekeeping Federation, certain crops like blueberries and cherries, are 90% dependent on honey bee pollination. America’s almond industry is entirely dependent on honey bee pollination. “They’re essential, and a lot of people don’t know what bees do in general to keep the circle of life moving,” Collins says. If you never stopped to thank bees for the role they play in putting fruits and nuts on your table, maybe you’ll stop to thank them next time you drink a honey beer. Just please, don’t expect it to be sticky sweet.